Mules’ Day (Día de las Mulas) is associated with pre-Hispanic rituals in which people gave thanks to deities through offerings. It is believed that a mule knelt in reverence to God on the day of Corpus Christi which is celebrated the same day. To give or receive a toy mule is considered a friendly joke today. 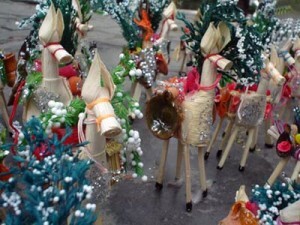 With this tradition in mind , stalls line Plaza Civica sell hand crafted mules and other toys. In addition, people with the name “Manuel” or “Manuela” celebrate their saint this same day.